Want to enhance the recording ability of Bandicam? If your graphics card supports AMD App Acceleration, you will be able to enhance the recording ability of Bandicam by using the GPU of the graphics card. 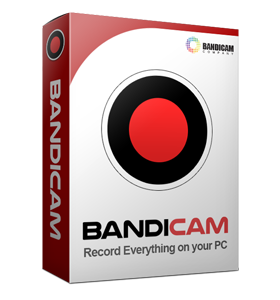 Bandicam 1.9.2 or a higher version supports the AMD VCE H.264 encoder, so Bandicam users can record the target in high speed, with a high compression ratio, and in high quality. Go to https://support.amd.com/, and download/install the latest AMD video card driver. Click the Settings button under the Video tab of Bandicam, and then choose the "H.264 (AMD VCE)" encoder. Keyframe interval: If you choose "150" as the Keyframe interval, keyframes will be created every 150 frames. Try the latest version of Bandicam from https://www.bandicam.com/downloads/. "H.264 (AMD VCE)" is available on Windows Vista/7/8/10. - If you use 'Windows XP', the "H.264 (AMD VCE)" menu will not be shown. Uninstall graphics card driver and re-install the latest AMD video card driver. Identify the model of an AMD graphics card. If your graphics card supports "VIDEO CODEC ENGINE (VCE)", you can use the AMD VCE H.264 encoder. Please visit https://www.amd.com/ to check if your graphics card supports "VIDEO CODEC ENGINE (VCE)". Desktop: HD 7700 or higher AMD graphics cards (HD 7700/7800/7970/7990, R7 250X/260/260X/265/360/370, R9, RX 460/470/480/540/560/570/580, Firepro, etc.) support the AMD H.264 encoder. Desktop: HD 7600 or lower AMD graphics cards (HD 7900, R5 2xx/3xx/4xx, R7 240/250/340/350, 6xxx, HD 5xxx, or HD 4xxx, etc.) don't support the AMD H.264 encoder. Laptop: HD 7700M/7800M/7900M/8830M/8850M/8870M support the AMD H.264 encoder. Laptop: HD 7300M/7400M/7500M/7600M/8500M/8600M/8700M/8800M/8900M, and R5/R7/R9 M200 series don't support the AMD H.264 encoder. 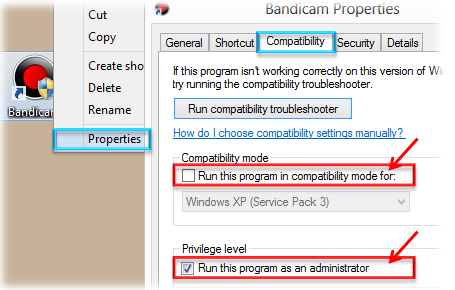 Uncheck "Run this program in compatibility mode for:"
Right-click on Bandicam -> Properties -> Compatibility -> and uncheck Run this program in compatibility mode for: . If this option is checked, the "H.264 (AMD VCE)" menu will not be shown. 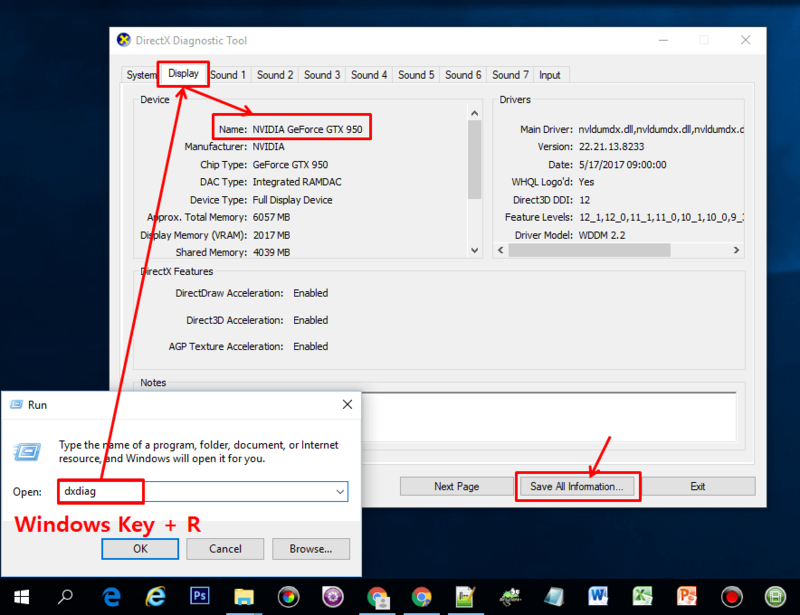 Please enter "Windows Key + R" -> type "dxdiag" -> Display -> and click the "Save All Information..." button and then send the DxDiag.txt file to bandicam@bandicam.com. Error message: "Your system does not support 'H.264 (AMD VCE)', so the default codec will be used." 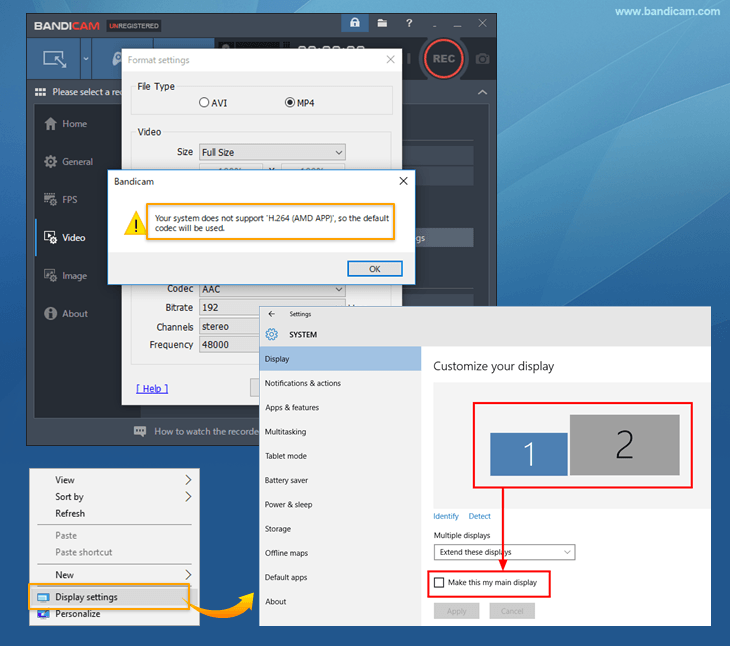 If you see the error message above when you use the 'H.264 (AMD VCE)' codec, go to your Windows Desktop, right-click, select Display settings, choose another display ("No. 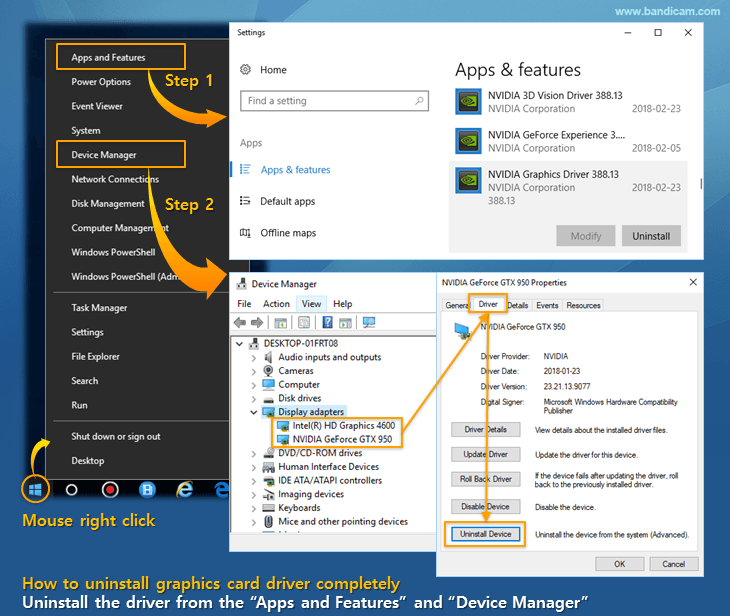 1" or "No.2") which is being used by AMD, check the Make this my main display option, and try it again.